After yesterday's Modi Juicy Nails nail polish no. 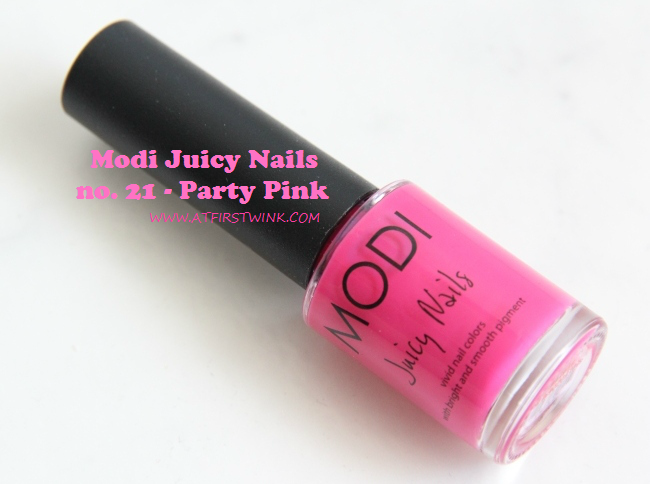 19, which is a pretty coral jelly nail polish, I now have the Modi Juicy Nails no. 21 - Party Pink to show you. While the other nail polish can still be considered as somewhat cute and jelly bean like, this nail polish is a bright fuchsia color. Keep reading to see how it looks on my nails. Since the color of the nail polish is a lot darker and not sheer, it already looks alright with just one coat. But to make it look nicer, it is better when you apply two coats. I used two coats for the pictures underneath and you can't see the white edges of the nails anymore, while this was still the case with the previous nail polish after three coats.